Check Out These Two Challenging Stairways – One Was Just Seen on “American Ninja Warrior”! | Keep It Up, David! Check Out These Two Challenging Stairways – One Was Just Seen on “American Ninja Warrior”! 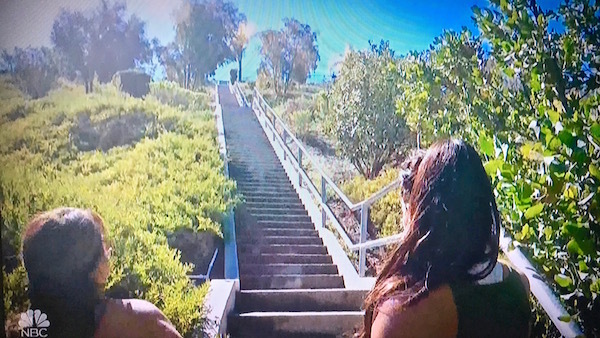 I love climbing stairs that I see on TV, so I was positively geeked when I watched “American Ninja Warrior” last night and saw a familiar sight: the Pico Canyon Stairs! I visited these stairs last November, and while I posted photos on Instagram, I never blogged about it. Until now! …and a photo from my visit. 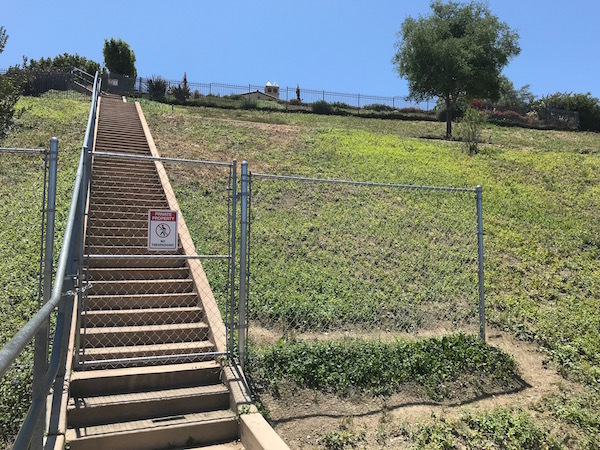 The Pico Canyon Stairs are located, conveniently, in Pico Canyon Park, which has the very convenient address of 25600 Pico Canyon Road in Stevenson Ranch. Once you park in the little parking lot, follow the trail to your left (heading east), go about 500 feet, and you’ll see the stairs off to your right, after you cross a tiny stream (which may be dry, depending on the time of year you go). …or you can just climb them regularly, like I did, three times. (I arrived there after going on a hike, so between the two I had a full workout.) There’s great mountain views once you get towards the top! 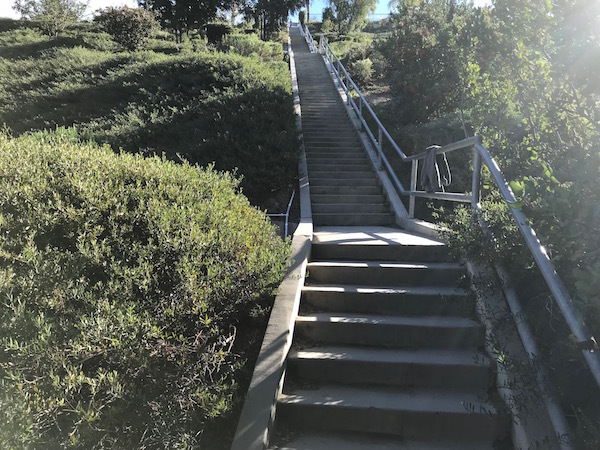 So go enjoy a workout at the Pico Canyon Stairs… and then tell everyone that you work out at the same place as “American Ninja Warrior” veteran Tiana Webberley! RELATED CONTENT: As-Seen-On-TV stair workouts have become a regular thing for me. 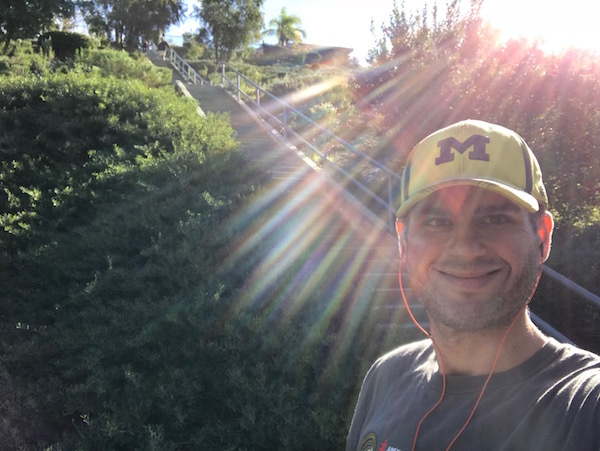 Check out my workouts based on stairs seen on “This Is Us,” “Splitting Up Together,” and on a Kardashian show! The other stairway I want to tell you about is on the other side of town, in the Los Angeles suburb of Calabasas. Calabasas is an affluent area, full of celebrities (more on that later! ), and there’s also great hiking, because it’s in the Santa Monica Mountains. 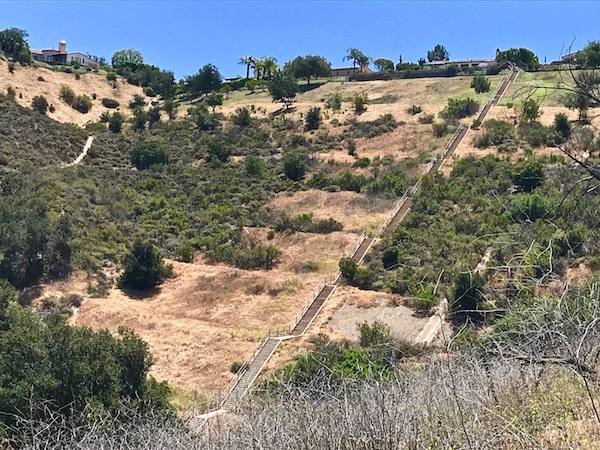 The Calabasas Stairs stretch up a huge hillside, and it’s one of the longest outdoor stairways I’ve ever been to! Getting there involves a little bit of hiking. Park at 25169 Calabasas Road. The only thing at that address is a short little driveway, with a chain that prevents vehicles from driving on it. It’s a few hundred feet before Calabasas Road ends in a cul-de-sac. It might be a bit confusing getting to the stairs, so I overlayed my route over the satellite image of the area. Red dot: Park here, and walk down the short driveway. It goes down into a ravine and up the other side. 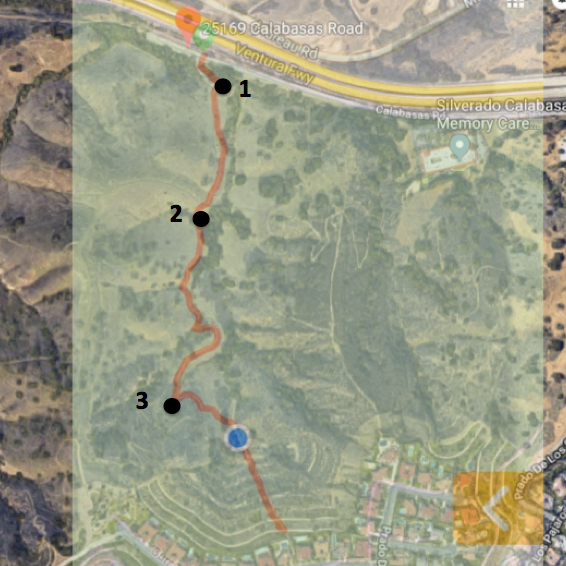 Dot 1: When the paved driveway ends, make a right turn onto the trail and walk away from Calabasas Road and the 101 Freeway, which is right behind it. Dot 2: The trail forks. Stay to the right. Dot 3: The trail forks again. This time go left, down into the ravine. By this point you will have seen the stairs multiple times while hiking. You’re almost there. The ravine is steep, so watch your step, and then hop over the narrow creek and onto the paved walk that will take directly to the base of the stairs. Blue Dot: The base of the stairs. It took me 10-15 minutes to hike from the red dot to the blue dot, and apart from very short, very steep sections at the beginning and end, it’s pretty flat and manageable. But now it’s time to climb some stairs! BUT WAIT, THERE’S MORE! There’s a locked gate and a short fence, and more steps on the other side. 78 more steps, to be exact, and they are easy to get to, because you can easily walk around the fence, as many people have done in the past. There’s a “No Tresspassing” sign on the gate. I’m not going to incriminate myself and say that I went around the fence and climbed those last 77 steps… but generally speaking I don’t like leaving unclimbed steps on the table, so interpret that however you like! 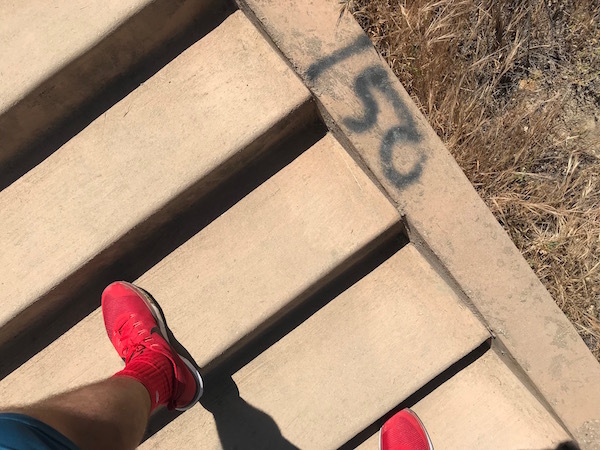 There’s 455 stairs total, before and after the gate. I may or may not have done all 455! 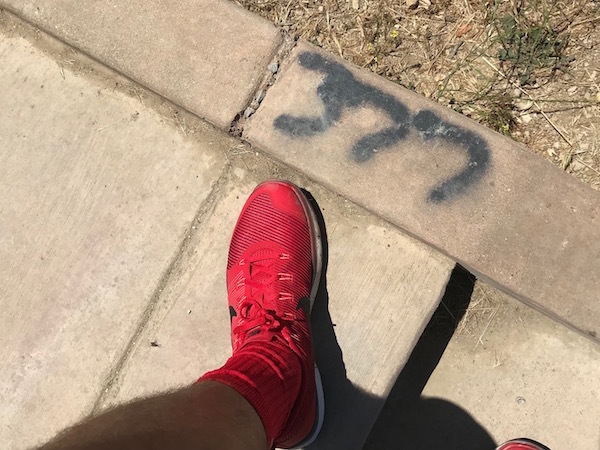 There’s a neighborhood at the top of the stairs, called The Oaks of Calabasas, and it’s a very private, gated, exclusive neighborhood filled with multi-million dollar homes. There’s even a more private, gated community within the gated community, made up of even larger estates. So if you have $10-20 million dollars and want to pass by two separate security checkpoints to get home, this is the neighborhood for you! Khloe Kardashian, Kourtney Kardashian, Justin Beiber, Britney Spears, Ozzy Osbourne, Katie Holmes, and Jessica Simpson all live or have lived in The Oaks of Calabasas, as have Michael Jackson’s children and mother. Two other people were working out on the stairs when I was there, and one graciously took a picture of me and the killer mountain views in all directions. Does that outfit look familiar? It’s because I wore it during the Oxnard Tower 2 Tower race, which I blogged about earlier this week. I stopped here on the way home, because it was more or less on the way. That was an exhausting race, and I was still a little tired, but I climbed the stairs twice. I started to climb a third time, but the heat and exhaustion got the best of me, and I turned around after 100 steps and started the hike back to the car. There’s no shade anywhere on these steps, and I was there around noon, which I don’t recommend. Go when it’s cooler, in the morning, or at least not on a sunny day when the temperature was in the high ’80s. 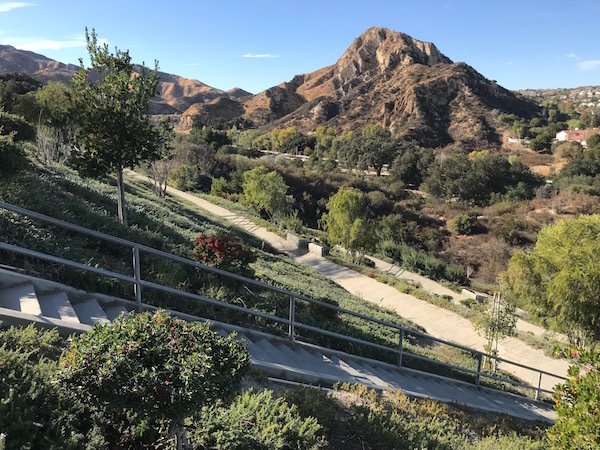 Another cool thing about the Calabasas stairs is that it’s in an area that rife with other hiking trails. So maybe I’ll go back and incorporate these stairs into a longer hike! Or maybe I’ll go back and just climb the stairs over and over and over again. Both options sound good to me! See you there? This entry was posted on Thursday, June 7th, 2018 at 1:14 am and is filed under Uncategorized. You can follow any responses to this entry through the RSS 2.0 feed. You can leave a response, or trackback from your own site. 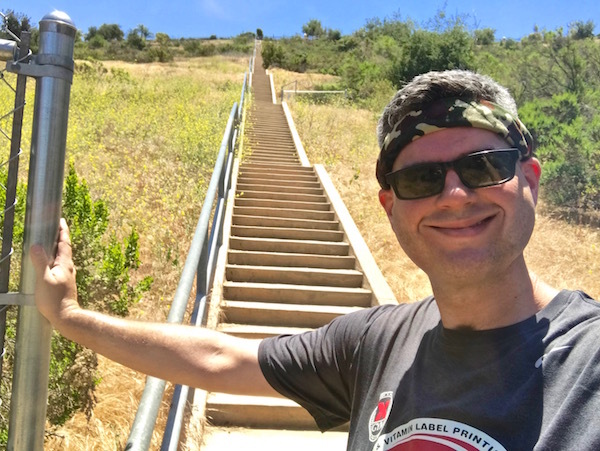 2 Responses to Check Out These Two Challenging Stairways – One Was Just Seen on “American Ninja Warrior”! Awesome article! 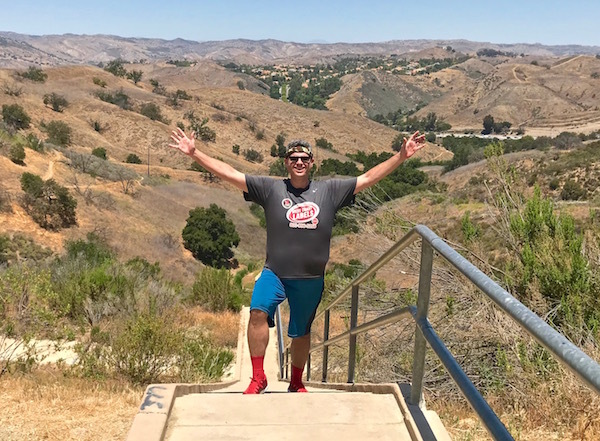 Thanks for the shout, I will definitely have to check out those Calabasas stairs sometime soon! Thanks for stopping by! Glad you enjoyed!